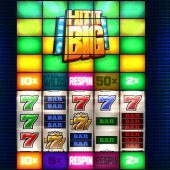 Hit it Big slot by Elk Studios is another retro-style game very much from the mould of Thunderkick's Arcader and Flame Busters or iSotBet's Neon Reels. We see traditional basic symbols, basic 1980's sounds form the audio side of things and there's a hint of old TV shows on the feature panel above the grid. The reels are set over a plain background too but there is certainly a lot of colour around the reels whether you like it flashing away or not! I really hope for the sake of our bankroll we can hit it big here, because it doesn't look easy in first viewing. 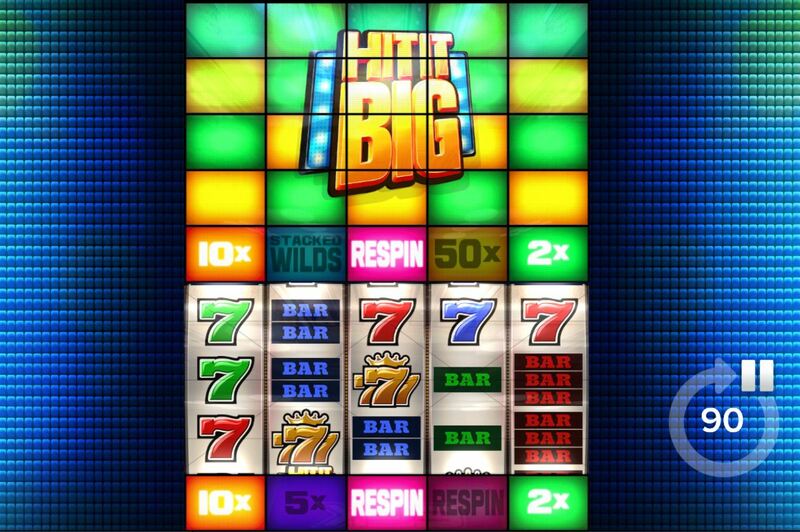 We being on Hit it Big slot with 5 reels of 3 rows each and surprisingly on 5 fixed pay lines although most symbols appear stacked to help us get around that. You get single Wilds or Gold 7's for the best 5-of-a-kind pay at 50x bet, Red 7 25x, Blue 7 20x, Green 7 16x with triple, double or single Bar awarding 6, 5 and 4x respectively. A feature is available but there are a few modifiers to find out about first. Multiplier - green, purple, orange or yellow will multiply any win on that spin by 2, 5, 10 or 50x respectively. Respin - triggers a respin of all reels, maybe again if a win occurs. Stacked Wilds - covers the reel the tile is under when activated with a full Wild. May or may not create a win. Locked Wilds - awards 3 respins with reels 1 and 5 both fully wild, like the bonus round on Microgaming's Bust the Bank slot. 3 logo scatters on the centre reels awards a picks bonus. The 25 tiles in a 5x5 grid above the reels now become symbols around the outside, such as shoes, bicycle etc. You press the stopper button and the symbol it lands on pays you a cash value for the object then turns into a Red Devil. You pick until you land on a Devil but you can also hit an arrow pointing at the Hit it Big icon in the centre. If you do, then a final pick will see those objects on the outside of the grid changed to wins of 100 to 1000x bet. Good luck getting the 1000x!